I wrote this article originally for Her View From Home, and wanted to share it with all of you. It was difficult for me to write, mostly because of some of the things I had to admit and come to terms with for myself. I hope in sharing my story, some of you mamas (or husbands) that have gone through something similar will get so sense of strength and peace from whatever your situation was. It was an emergency c-section (you can read the full story here), and something I was completely against. Two weeks before, I had told my husband that if this was the way their birth went, I would never be the same. But still, he held me and told me no matter what the outcome, it would all be okay. Do you have that one time that grew you closer to your spouse? Subscribe for more real life mommy-hood moments! The selected Optin Cat form doesn't exist. 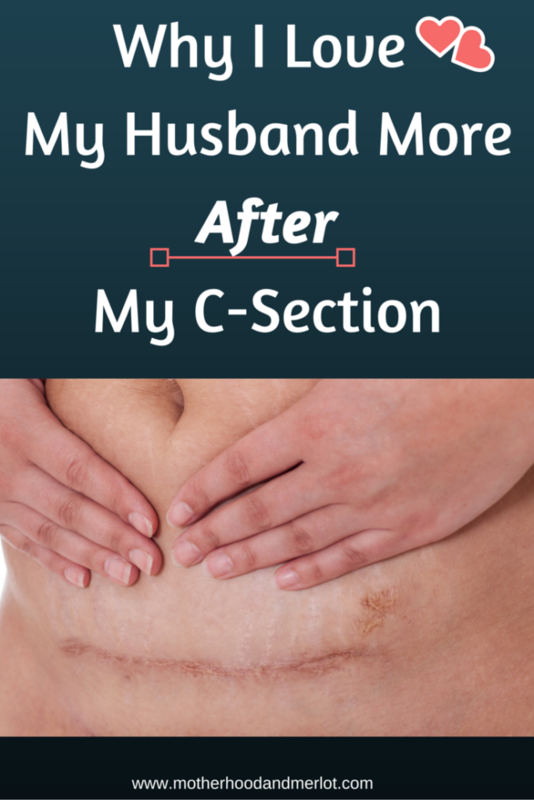 Childbirth def brought my hubby and I closer… it is such a crazy experience, esp with a csection! I had 2 c sections and can relate to this so much! It took me a long time to recover too. It does get better, but the disappointment never goes away. It’s amazing how much our husbands are willing to do for us, isn’t it? Even if we are a crazy hot mess (speaking for me being a hot mess, not you<3). Thank you so much for sharing your story. Not everyone knows how difficult it REALLY is. I can so relate to this!!! Until my c-section I was lucky that I had never been in a situation where i was dependent on anyone. I was not at all prepared for that recovery, let alone caring for my toddler and now newborn. It’s been a year and sometimes I still feel the scars, but it did make my husband and I so much closer. What a tough experience to go through! I don’t know what it’s like, but I’ve heard it is a very hard thing to endure. Luckily my recoveries were fast with the exception of my first child. That was another story. Time heals those wounds and I’m forever grateful for the help I had. Right?! I completely agree, thank you for husbands. It’s so hard mama! Big hugs to you, it is not an easy thing at all. I couldn’t even imagine recovering from a c-section let alone with two other little ones at home. Recovering from child birth mentally is no easy task and then adding in the surgery aspect, its a lot of work! My sentiments are very much the same as most of yours, my husband loves me and my body more than he had ever loved me before which in turn has made me appreciate him and love him even more than words can describe! I will sit and stare at my scar from 4 c sections and his answer is always the same, you are more beautiful now than ever, this scar represents our children and our love, how can I not love this man! That is so amazing to hear. I love it! I had my baby in july c section because of difficulties. I had a c section and fevers bc it had became infected 10 days straight without meds responding. In those 10 days and even month after due to my wound opening up and leaking my husband bathed me took me to the br everything you had mentioned plus even packing my wound after leaving the hospital 10 days later for 3 months so that it can heal. I am also very independent and felt broken (still feel unlike myself with how my body changed) but i am greatful to him and saw the amount of love he had for me bathing me and dressing me while i had visitors waiting in the hospital. Terrified everytime i was delirious from a high fever. I have never once seen him cry until all this occurred and broke him. I couldnt love that man more for everything he did and for my beautiful baby boy.